Your HVAC system has a lot of moving parts that experience normal wear and tear over the years. Normal wear and tear includes loose screws, stretched belts, parts that need lubricated, and loose electrical connections. Over time an HVAC system will also get dirty, clogged, and need occasional part repair. At Powell & Turner, we do up to an 80-point system evaluation and safety inspection–the most extensive preventative maintenance in our area. So what exactly do we do during our 80-point furnace or AC maintenance? Your technician will check for anything that shows wear or needs to be lubricated. Keeping your fans and moving parts lubricated keeps them protected, and your system working more efficiency by reducing friction. Your thermostat will be calibrated and refrigerant levels checked. Low refrigerant levels can prevent your air from cooling properly, and cause your condenser to freeze up and lead to costly repairs. An important part of maintenance is replacing or cleaning the AC and furnace filters. A dirty filter restricts air flow through your unit, making it work harder and be less energy efficient. Additionally, a clean filter is vital for your air quality by keeping dirt and dust from blowing into your ducts and into your home. It also keeps parts of your HVAC from getting prematurely dirty, such as your coil. (See below why it’s important to have a clean coil). Our yearly preventative maintenance includes a 19-point safety inspection. We check things like the gas pressure, shut off valves, and electrical components. We also check for any fire hazards like burn marks on your circuit board, flue condition, proper ignition, exposed wiring, and more. We’ve already mentioned some efficiency checks we make like filter replacement, part lubrication, cleaning, and electrical connections. But there’s more that a yearly tune-up will do for the efficiency of your equipment. Your technician will check, adjust, and lubricate (if needed) your unit’s blower assembly. Your blower assembly is what moves the cooled or heated air throughout your ducts and home. So having a well functioning blower assembly means better air flow through your home and cools or heats it more evenly, and prevents uneven temperatures throughout your home. Another important part of maintenance is having your coils cleaned. The coils in your system, like anything else in your home, gets dirty over time. When the coil is covered in dust or dirt, it inhibits the airflow, making the coil less efficient at absorbing and transferring heat. 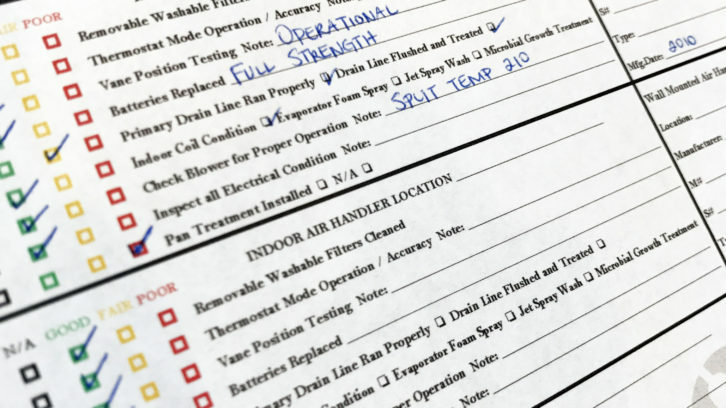 These are just some of the most important cleaning, adjustments, tuning, and testing we do on your HVAC system during our yearly preventative maintenance. Take a look at our a complete 80-point checklist. 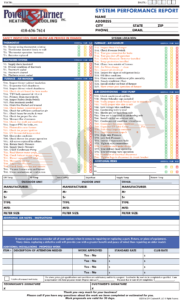 At the end of our Maintenance Service, you will receive a copy so you can go over and keep track of the complete overview of your heating and cooling systems. Ready to schedule your Maintenance Appointment in the Baltimore Annapolis Area? Contact us online to schedule today!